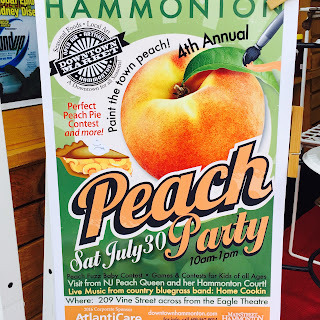 It's peach season in New Jersey (and PA, DE and in the USA). I love peaches but until now, the only peach foods I tend to cook have been pies, cobblers, crisps, brown Betty's and my infamous Fire Roasted Peach Salsa and Peach Infused Bourbon. Thanks to the inspiration of my friends at the South Jersey Foodswappers, I've made a slew of peach foods, with more ideas simmering on my back burner...I'll be putting up more peaches into bourbon to infuse; saving those peaches for use in a tipsy coffee cake; cooking another batch of peach and tomato chutney, and if I have the time, peach preserves. Lest I have too many containers of the same peach foodstuffs, I had the opportunity to trade with my friends for their peachy keen goodies. 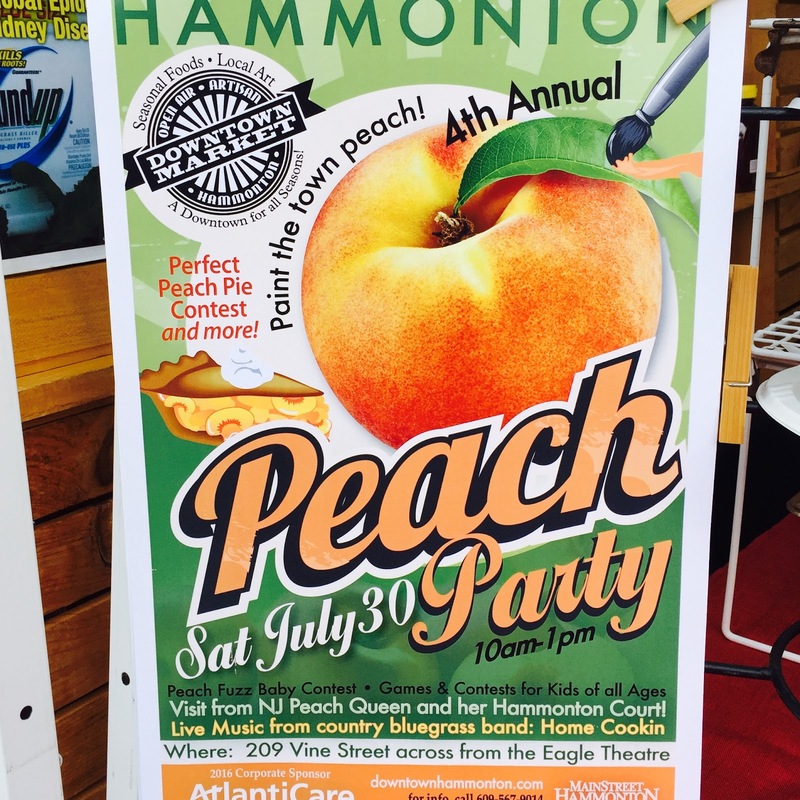 This past Saturday, July 30th, South Jersey Foodswappers held their food swap in Hammonton, NJ, in conjunction with the town's 4th Annual Peach Festival. No better time to have a peach-food-theme than when peaches are at their peak. I brought three peach foods, the aforementioned Peach Chutney, Fire Roasted Peach Salsa, and a Tipsy Coffee Cake. Tipsy Coffee Cake was baked from a mix which I then doctored. It was a wonderful box white cake mix enhanced with bourbon infused peaches, fresh peaches, vanilla bean paste, milk, butter, yogurt, and a streusel topping made with flour, butter, brown sugar, cinnamon, and oatmeal. The peach bourbon liquid was drizzled over the cake batter before the cakeletts went into the oven to bake. Believe it or not, the box mix is a new line of Pillsbury cakes mixes - Purely Simple. Pure ingredients, no artificial flavors or dyes. The cakes come out tasting home-made, which they are, especially if you have doctored the cake mix. I've always been a fan of box mixes because you can alter them and make them your own. This line is inexpensive as far as "fancy" mixes go. Whereas I never liked their mixes and frosting, I'm now a fan of Pillsbury's Purely Simple line of goods. Honestly, they are truly good mixes and easier to make than home-made in a pinch. Look out Duncan and Betty - The Dough Boy is making his moves on me. On this hot and humid Saturday, we packed up my car and drove down to the Blueberry Capital of the World for our peach food swap. Nate and the Mrs. joined me making this a real family affair. Nate helped set up my table - over seeing my samples and roaming around to check out the other tables. He and Liz both reported back to me on the items they most wanted. Not everything was made with peaches, allowing for a larger variety of products to trade. We snagged some excellent Basil Hummus and Chocolate Fudge from my friend, Winnie. She in turn hotfooted it over to me first to grab one of my Tipsy Coffee Cakes! Because the swap was over so quickly, I barely had time to truly take in all of the things on offer. Winnie had hummus, cake, and fudge. My friend Amy had Bellini Dessert topping, peach preserves, cake, and face toner among other things. Organizer, Lauren, had eggs from her chickens, peach mustard, and peach filled baked goods. There was granola and peach and blueberry crisp from Gina. Newcomers Elizabeth and her husband had scrubs, eggs, perfumes, natural cleaning products, and Peach Jalapeno Jam (perfectly served on a turkey meatball for sampling). Connie had eggs, peach and raspberry pan dowdy's, peach and mango sangria. Karin came in from Philadelphia, bringing drunken cherries and peach rhubarb butter. Jo Ann brought zucchini relish and probably other items but I was too hot and over-whelmed to remember all of her other goodies. Mary Faith, baked Peaches and Cream muffins. I'm sure I missed some items and people - please accept my apologies for not mentioning you! There is something so exciting about unpacking your food swap "winnings" when you come home after a swap. Into the freezer when a bunch of cakes and muffins to savor for later. We devoured the peach and blueberry crisp. Nate and Liz are enjoying the fudge. The basil hummus became a part of our evening's antipasti platter. Lauren's eggs, so orange and fresh, were our Sunday lunch. I have preserves for future tastings. The Peach Jalapeno Jam will become part of a sauce for grilled pork chops I'm making tonight. Pork chops, I will add, that are from my friend, Bailey and Thomas' farm, Ardelia Farm and Co. in Vermont. I truly know where my food comes from! Swapping with this group of friends is one of the highlights of my swapping world. I am so fortunate to know this crowd. The South Jersey Swappers are a genuine group of fun-loving, interesting people who want to build a community of like-minded people who enjoy sharing their foods and home-made creations. Living, eating and cooking my meals, knowing where my food comes from is the best feeling. Eat Local, support small farms!